Meek Moment Triggers Demands for Justice Reform - This Can't Be Happening! Speakers from popular hip-hop artists to pro football players to State Representatives and a sports legend all slammed the prison sentence meted to Mill and serious racial inequities in the justice system like race-based Stop-&-Frisk policing – a scourge in Philadelphia for decades. Basketball legend Julius “Dr. J” Erving, the NBA Hall of Famer who played for the Philadelphia 76ers, called Mill’s sentence cruel and “rendered under unsavory circumstances,” a reference to alleged antics by Mill’s judge. Current 76ers co-owner Michael Rubin requested leniency for Mill in a letter he sent to that sentencing judge. Rubin and Mill are personal friends. 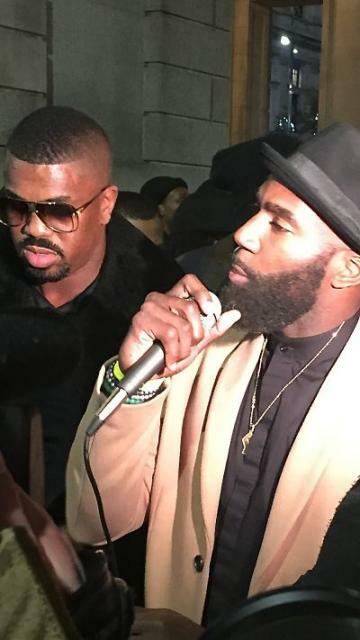 Popular Hip Hop artist Rick Ross said, “This demonstration will speak for so many others. What happened to Mill is not just a miscarriage of justice. It is an abortion of justice.” Ross stated that the Mill rally was his first participation in a public protest over justice system inequities. Philadelphian Mill, born Robert Williams, received the sentence from Common Pleas Court Judge Genece Brinkley who has presided over his case beginning with his 2008 drugs/gun conviction. Brinkley had withheld incarceration for the chart-topping artist during prior parole violations, extending breaks to Mill that most in comparable circumstances do not get. Parole violators comprise one-third of the 47,318 inmates encarcerated in the state’s prisons. When Brinkley sentenced Mill to prison, she indicated her patience had run out with the rapper. Brinkley cited Mill’s failed a drug test this year and his two arrests this year: one for a scuffle in the St. Louis airport and the other in New York City. NYPD arrested Mill for reckless endangerment after he posted a video of himself on social media doing wheelies on an ATV without a helmet in NYC. While authorities withdrew charges for the St. Louis and NYC incidents, Brinkley considered each a parole violation. When Brinkley sentenced Mill to prison, she rejected recommendations from prosecutors and parole personnel for no jail time. Mill’s attorney, Joe Tacopina, blasted Judge Brinkley, calling her sentence a personal vendetta. Tacopina asserts Brinkley attempted to have Mill record a song where he would mention her by name and Brinkley attempted to have Mill leaving his current manager, music mogul Jay Z and hire a personal friend of hers for the job instead. Brinkley could not respond to the accusations leveled by Tacopina due to restrictions in the state’s judicial code of conduct that bar judges from commenting on pending cases. However, that conduct code instructs judges to conduct their personal and extrajudicial activities to minimize risking conflict with the obligations of judicial office. The FBI is examining Judge Brinkley’s actions in the Mill case according to media reports that the FBI neither confirms nor denies. During a Philadelphia radio interview the morning after the Mill rally, local activist, Rev. Greg Holston, said, “We would like to see Dr. J and other celebrities come out to other protests. That way we can make more progress.” Holston is executive director of POWER, an interfaith organization in Philadelphia working for systemic change to better communities. Hours before that evening courthouse rally for Meek Mill, the lead Black Lives Matter Pennsylvania activist was arrested at the State Attorney General’s Office in Philadelphia when he requested an update on that Office’s investigation of the Philadelphia policeman who fatally shot a black man in the back earlier this summer. That same officer had shot and paralyzed a black man years earlier under similar circumstances: shooting a fleeing unarmed person in the back. None of the speakers and participants at the Mill rally joined the BLM activists at the State AG office. 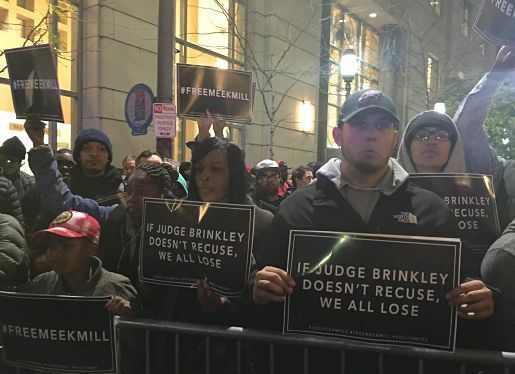 While Mill rally participants were very vocal in their demand for Mill’s release and profanely critical of Judge Brinkley, when rally organizer, film producer Sixx King, reminded participants to vote there was no roar of approval. Only 20 percent of the registered voters in Philadelphia went to the polls during the November 7, 2017 election. But a historic number of voters elected a progressive civil rights attorney as Philadelphia’s top prosecutor. Larry Krasner, who has over the course of his career, sued Philadelphia police 75 times for various cases of misconduct. He has pledged to make major reforms in the city’s criminal justice system. One reform sought by Krasner and others is ending cash bail for low-level offenses. Hundreds of poor people languish months, sometimes years, in pre-trial detention – ringing up incarcerations far in excess of the small bail amount.